Do you have an IT professional handling the technology in your business, or are you thinking about moving into an outsourced IT services model as so many small businesses owners are? According to a survey completed by CompTIA 62% of the organizations surveyed planned to make greater investments in Outsourced IT Services (managed services) over the next two years. If you are contemplating moving in this direction let us help you understand exactly what your IT Service Professional should be doing to support and enhance your business technology. 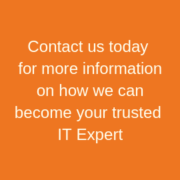 Trusted Expert Advisor: Your IT Service Provider should be an expert in consulting and providing IT services to the small business, this may also include a skilled staff that would be very costly for you to duplicate on your own. And finally, they should understand your business, and provide technology enhancements that will streamline your productivity, while increasing profit potential. Proactive Management: Proactive monitoring and management of desktops and servers provides insight into how your infrastructure is running, and allows for planning of replacement equipment in order to minimize workforce disruptions. Secure & Backed Up Infrastructure: You will be able to rest easy know that you network is secure from outside attacks, and if a disaster or human error occurs erasing some or all of your data your IT service provider should be able to quickly recover any lost data and get you back to work. Increasing Efficiency & Productivity: Being able to schedule maintenance, and identify slow running desk tops and networks helps increase employee productivity. Streamlining workflows with advanced technology increases your businesses efficiency. Controlled Costs: When you commit to an outsourced IT service model you are provided all of the technology service for your business for one monthly fee. You will no longer receive inflated bills for technology emergencies. Allow you to Stay Focused: With someone else managing your technology infrastructure, minimizing employee downtime, and increasing productivity you are able to focus on growing your business not managing technology headaches. Scalability: Since your IT service provider understand your business goals; they will keep them in mind as they implement new and enhanced technology. As your business continues to grow you will not be shackled by inflexible technology.